Here on Earth, where you have water, energy and nutrients, you have life. So does the presence of water mean life might exist on other worlds? 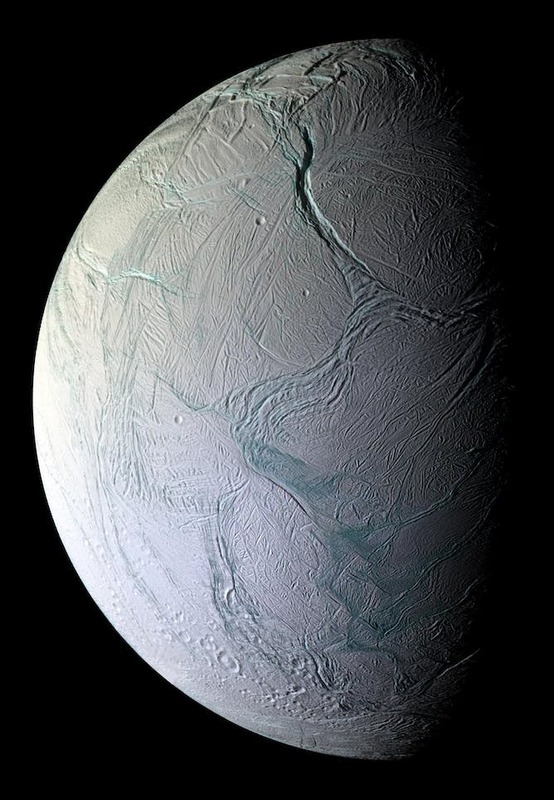 There was much excitement when NASA recently revealed new details about the oceans that lurk beneath the surface of Saturn’s tiny moon Enceladus and Jupiter’s Europa. 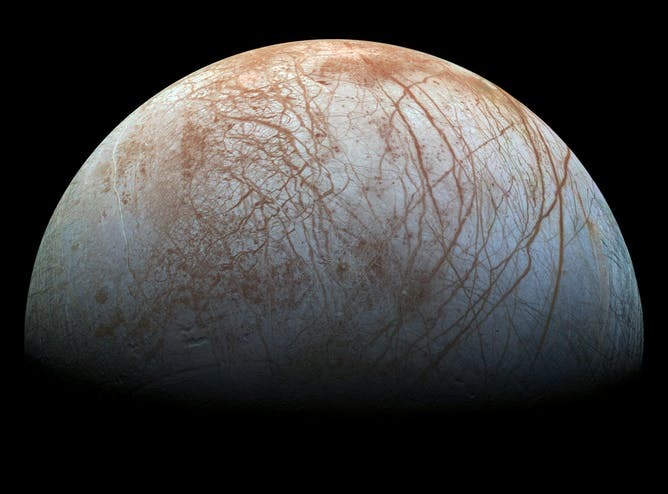 Jupiter’s icy moon Europa has also long been known to host a sub-surface ocean that contains more liquid water than is present on the entire planet Earth. Like Enceladus, it is thought that the base of Europa’s ocean might feature hydrothermal activity, and hence that it might be a suitable place for life to develop and thrive. This month’s results tie Europa and Enceladus more closely together than ever. Observations of Europa with the Hubble Space Telescope revealed two episodes of geyser-like eruptions showed water being ejected to an altitude of 50km above the moon’s surface in 2014, and 100km in 2016. Eventually, at distances several times farther from the Sun than the Earth, the temperature was cold enough for water to be solid, a point called the “ice line” or “snow line”. 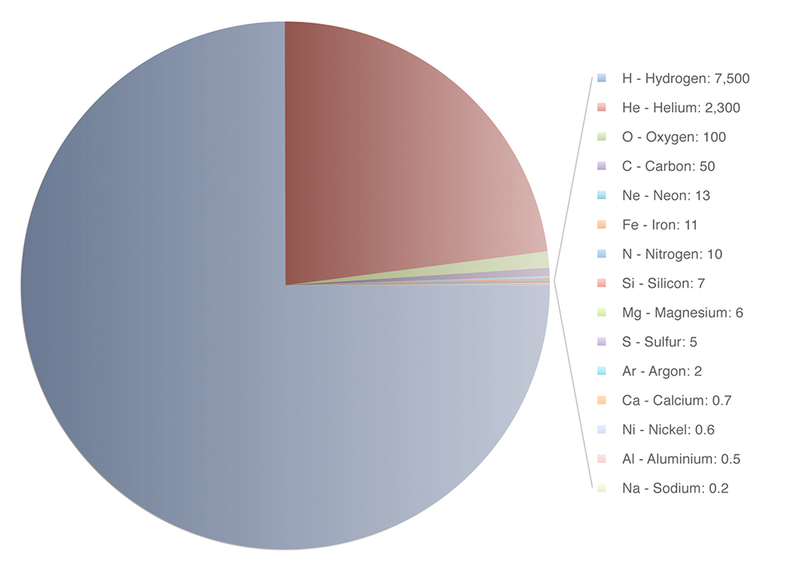 Beyond this, water ice made up the great bulk of solid material. With more solid material, the distant planets grew far more rapidly than their terrestrial cousins. At the heart of Saturn, Uranus and Neptune, and probably at Jupiter’s core, lie the seeds around which those planets’ gaseous atmospheres were gathered. Dust and gas in the disk gradually stuck together, growing to form larger and larger cores. Eventually, a critical mass was reached, at which point the growing proto-planets’ gravity could feed from the gas around them in the disk, swelling them into the giants we see today. Just like Earth’s mantle, that material is likely molten - not an ocean as we imagine it, but certainly not hard, solid rock. The first such ocean identified was the one beneath the ice of Jupiter’s moon Europa, a world about the size of our Moon. But Europa is not alone. 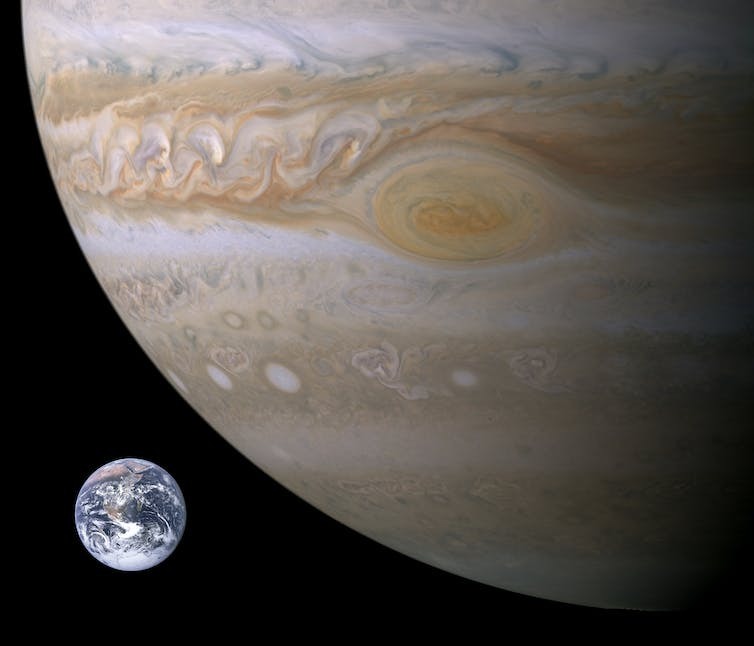 Results from the Galileo spacecraft, which orbited Jupiter for eight years in the late 1990s and early 2000s, found tantalising hints that two of Jupiter’s other large moons, Ganymede and Callisto, may also house deeply buried oceans. Then came the Cassini mission to Saturn. Saturn’s largest moon, Titan, has a thick atmosphere, and Cassini deployed the Huygens lander on its arrival in the system, to parachute through the clouds and see what lurks beneath. The answer is lakes, rivers and rain. But not liquid water. 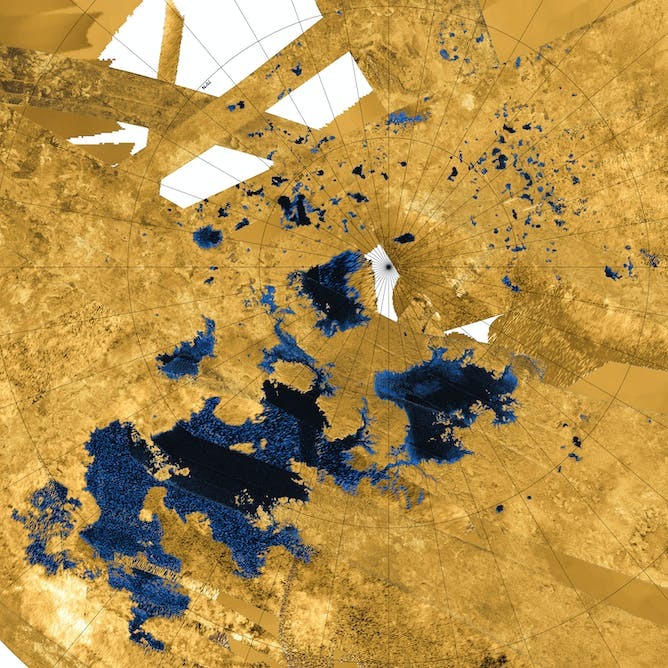 The ice on frigid Titan’s surface is harder than granite. Instead, Titan’s surface features liquid methane and ethane and large, slow-falling raindrops of methane. 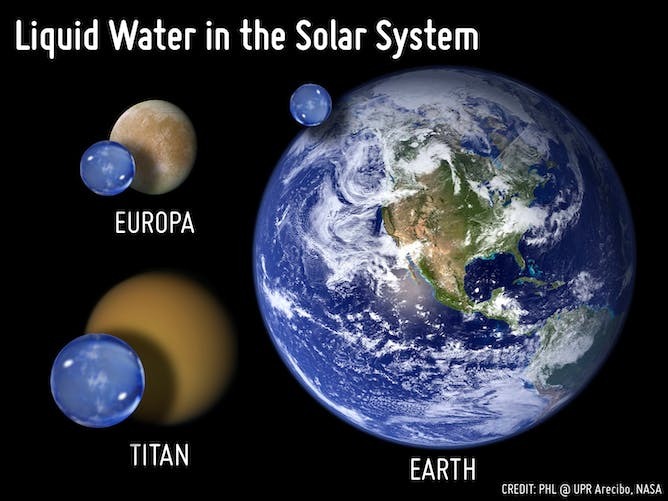 More recently, Cassini measurements have suggested that the ethane and methane oceans on Titan might not be the only liquid there. Just like Europa, there is evidence of a saltwater ocean buried deep beneath the moon’s surface. It isn’t just moons in the outer Solar system that seem to host liquid water. Recent research has suggested that the largest asteroid, Ceres, might have just such an ocean, as might Pluto. This isn’t actually a surprise. 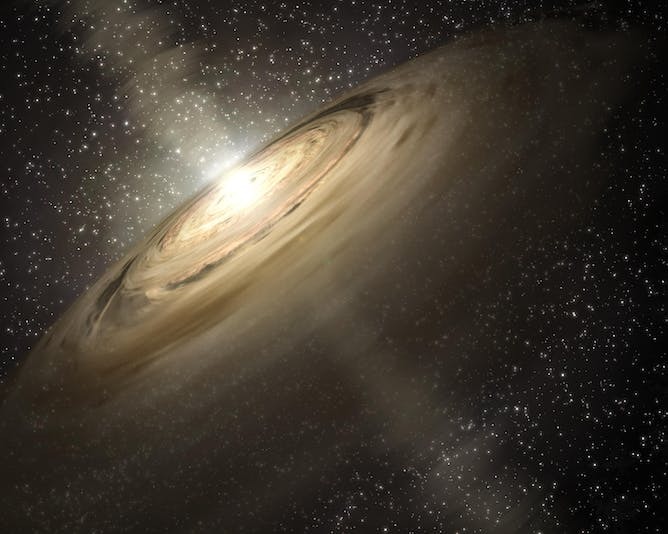 Earth formed in the warm part of the protoplanetary disk, at a location well within the “snow line”. In fact, the origin of Earth’s water has been a puzzle to astronomers for many years. It seems most likely that Earth’s water was delivered from the colder reaches of the Solar system through impacts, most likely from the outer reaches of the asteroid belt. That delivery through bombardment would also have targeted Mars and Venus. There is growing evidence that both Mars and Venus once had oceans much like Earth’s - until the vagaries of time took their toll. In the 4.5 billion years since the Solar system’s formation, the Sun has grown markedly more luminous. As a result, Venus grew ever warmer until its oceans boiled, hundreds of millions of years ago. 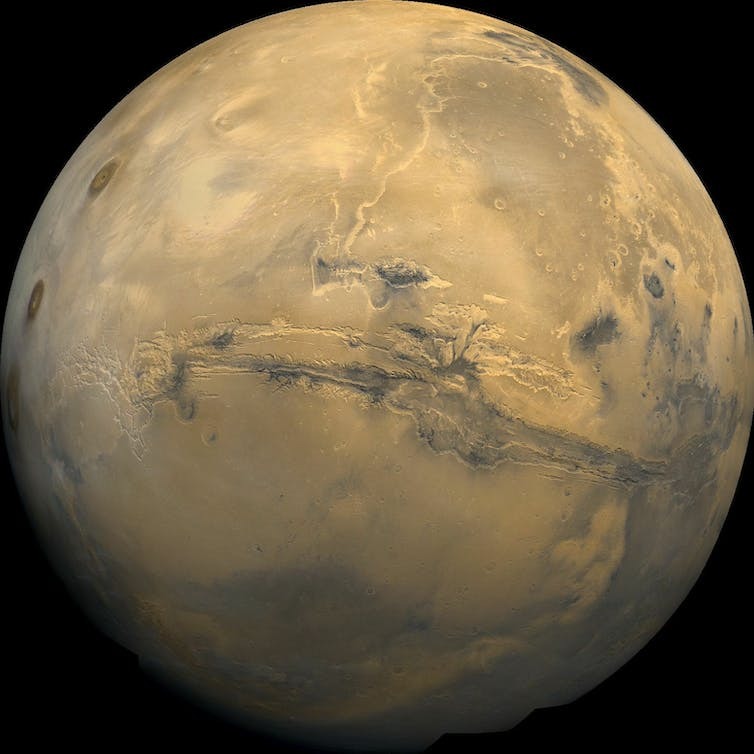 Mars, by contrast, has gradually frozen, losing its atmosphere under the combined influence of chemical weathering at the planet’s surface, and the stripping action of the Solar wind and radiation. The water is still there, but no longer in the form of planet-girding oceans. What does this mean for life elsewhere? Well, if our Solar system tells us anything, it is that our universe is drenched in water. Quite literally, there’s water everywhere. Maybe, just maybe, that’s a hint that we might not be as alone as we think. What will we learn about the origins of our solar system? Everything you need to know about the revolutionary gene-editing tool. We're venturing farther into space and discovering more about our solar system than ever before. Is our search for alien life being held back by our desire to protect it?